The holidays are a magical time for kids—full of delicious smells coming from the kitchen, the sound of Christmas carols on the radio, and crafting fun DIY projects to keep and remember from year to year. This season, depart from the store-bought gingerbread house making kit, and set kids to work building their own mini Christmas trees. Explore materials like cardboard tubes and patterned paper and colorful pom poms, then let little ones loose to build and decorate festive pine trees. Get your holiday making started with these 20 easy, kid-friendly tutorials. Not only is this an incredibly simple afternoon craft, but it also allows you to put those leftover wrapping paper scraps to use. Fill the center of popsicle stick triangles with patterned wrapping paper, then kids can paint and decorate the wooden craft sticks with stick-on gems and glitter. This project is a great introduction to simple shapes, as well as simple design, for little ones. Flip puzzle pieces to their cardboard backs, then paint in various shades of pine tree green. Arrange into a Christmas tree shape, and then glue onto a blank canvas or square of cardboard. Finish by decorating with bunched balls of tissue paper and sequins. In this clever kids’ craft, a clothespin does double duty as the Christmas tree’s stump and a handy stand. Pre-cut green triangles for little kids, then let them decorate with gems, sequins, or glitter. These look especially cute grouped together in a forest of sparkly pine trees as a DIY-ed centerpiece for your holiday spread. Trim a stack of empty toilet paper rolls to roughly form a triangle, then glue together with regular white school glue. The recycled cardboard takes paint well, so you can easily use a washable, kid-friendly formula and still achieve a colorful result. Add a loop of string to turn this decoration into a homemade ornament. This lovely little craft utilizes a simple paper marbling technique, where the secret ingredient is liquid starch. This one can get a bit messy, so be sure to protect clothes with smocks or aprons before beginning. Once you’ve achieved your perfect green, swirling, marbled paper, cut into a forest of triangular pines, and add a construction paper stem. For an easy, mess-free art project, break out the colored pencils or crayons and encourage kids to get abstract. Using a ruler, draw heavy black lines every which way across your page, then color the central green triangle in monochromatic green. To take this project up to the next level, provide a few glitter glues so kid artists can add a touch of sparkle to their trees. This Christmas tree craft allows children to create in three dimensions, challenging their design and building skills all while encouraging their creativity. Use a regular paper plate to form a cone, tape it into form, then paint. Glue on colorful pom poms, or try stringing metallic yarn around the entire thing as mini-garland. Patterned paper straws can be the building blocks of festive, cheerful holiday decorations. Snip apart a few different designs, then assemble Christmas tree triangles. Glue together, then add a loop of yarn to turn these into adorable handmade ornaments. Bring a little sparkle to your holiday craft time with this straightforward paper project. Kids can squirt glue in a scribbled zig-zag, then can add color and shine by sprinkling glitter on top. This idea works well for handmade holiday cards or thank you notes, too. Mix up a big batch of marshmallow puffed rice treats, add a few drops of green food coloring, then shape into triangles. Kids can join in by adding sprinkles or candy ornaments. Teeny pretzel rods work perfectly as edible tree stumps. 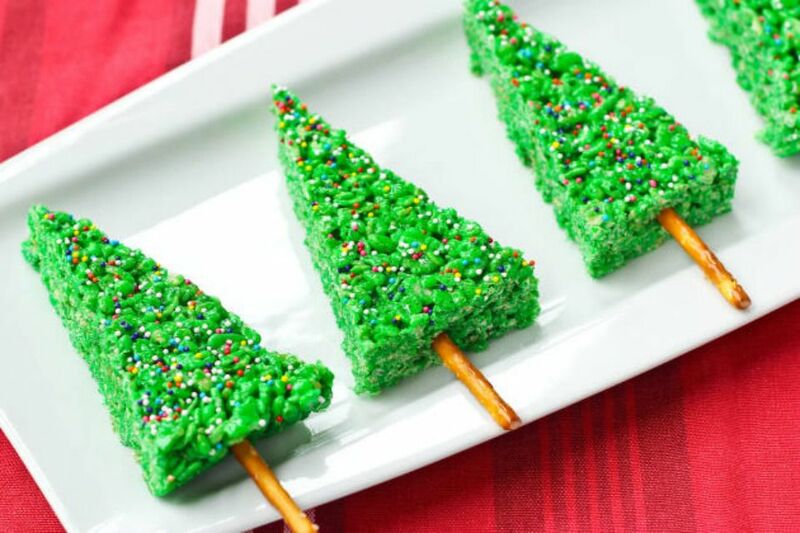 These sweet treats work wonderfully as a budget-friendly holiday snack for the entire class. Keep little hands totally clean, while still allowing a paint activity, with these DIY-ed soft, fuzzy stamps. Clip a pom-pom between a clothespin, then encourage kids to dip and stamp colorful circles onto a pre-cut Christmas tree. Heavier paper or card stock works best for this quick painting project. This is a wonderful option for toddlers just starting to explore with paint. Sticky, transparent laminating paper traps squares of tissue paper for a stained glass effect, no glue required. Kids can practice scissor skills by cutting tissue paper into chunks, then scattering them onto the sticky surface. Add another layer of laminating paper over top, then cut into a tree shape and frame with colored tape for a beautiful, light-catching decoration. Another great option that will make use of your holiday wrapping paper scraps: tear long strips of colorful paper, then arrange into a Christmas tree shape. The more colors and patterns in this craft, the better. This is a wise option for a mess-free afternoon of making. Save those empty wrapping paper tubes this holiday season, and add them to your craft supply throughout the year. Help kids snip a through-line to create a cardboard spiral, then they can paint and glue on ornaments (read: pom poms, sequins, or gems). There’s no better way to remind your family of your little one’s growth than with a set of painted prints of their teeny, tiny feet. Pair two green footprints together on one canvas, add in a sparkly star and scribbled stem, then frame it to display for Christmases to come. This craft works well as a DIY-ed gift for the grandparents, too. Send the kids out for a morning of scavenging in the backyard before an afternoon of crafting at the table. Pine cones painted green are the perfect little Christmas trees, and fuzzy pom poms are adorable as ornaments. Sprinkle some glitter on top for a sparkly, festive finish. Scour the recycle bin for your kids’ craft materials more often—it can be a veritable treasure trove of reusable supplies. Try fashioning a Christmas pine tree from an empty egg carton. Add a few layers of paint, then decorate. This project looks adorable with paper-made decorations (like teeny twinkle lights). Trade out the paintbrushes in your children's art box for a plastic fork. Instruct kids to practice dipping the fork in paint, then layering and stamping ridged strokes into a tree form. This painting technique is the perfect base for simple foam or paper ornaments. Pipe cleaners are a super kid-friendly craft supply: they’re bendable and re-bendable, and often don’t require any glue or tape. Twist a few green pipe cleaners around a wooden craft stick, then add colorful plastic beads as ornaments. Pop these crafts all over the house for a quick holiday transformation. This kids’ craft couldn’t be simpler. Cut 3 to 4 triangles out of colored card stock, then fringe with scissors. For children ready to work on cutting skills, this is the perfect project for practicing small cuts. Pre-made foam stickers or sparkly sequins make easy decorations on this paper Christmas tree.